Mr. Forman won an Academy Award for directing 1984’s “Amadeus,” which also won best picture. 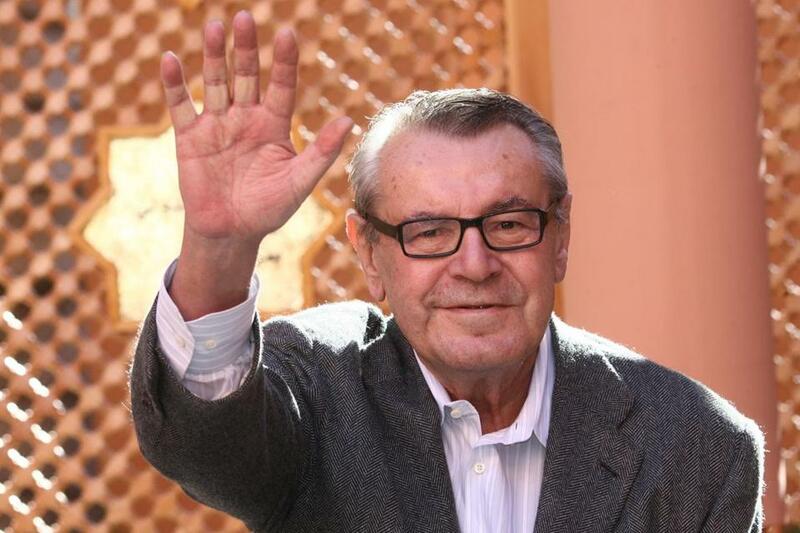 LOS ANGELES — Milos Forman, a filmmaker who challenged Hollywood with his subversive touch and twice directed movies that won Oscars for best picture, died Friday at his home in Connecticut. He was 86. A native of what was then Czechoslovakia, Mr. Forman came to the United States in the late 1960s as a rebellious young filmmaker whose satirical bent was little welcomed at home in the wake of the 1968 Soviet invasion. Just a few years later, Mr. Forman’s “One Flew Over the Cuckoo’s Nest” — a tragicomic story of revolt and repression in a mental institution — won five Oscars, including those for best director and best picture. The film put Mr. Forman in the front rank of those who struggled to make big, commercial films with countercultural sensibilities. His sympathy for the odd man out was always apparent, even as his movies grew in scope. “Amadeus,” a 1984 adaptation of Peter Shaffer’s stage play, presented Wolfgang Amadeus Mozart as a genius who undermined authority with his art. Again, Oscars for best director and best picture were among its many honors. Still, Mr. Forman, by then a US citizen, said one of his greatest pleasures from the film — which was shot in the Czech Republic — was the chance to return in triumph to his homeland. “I’ve always done everything in my life to win,” he said in a 1994 biography, “Turnaround: A Memoir,” written with Jan Novak. Mr. Forman was caught up in the turmoil of German occupation not many years after his birth in Caslav, Czechoslovakia, on Feb. 18, 1932. Both his mother, born Anna Suabova, and the man he believed to be his father, a teacher named Rudolf Forman, had been separately seized by the Germans and killed in death camps. For years, Mr. Forman vaguely told interviewers that he believed himself to be half-Jewish, though both parents attended a Protestant church. It was Novak, in researching “Turnaround,” who ended the mystery. After the 1964 release of his first feature film, “Black Peter” — about the misadventures of a teenager beginning his work life — Mr. Forman was contacted by a woman who had been with his mother in Auschwitz, Novak learned and eventually reported. The woman explained that he was actually the son of a Jewish architect with whom Mr. Forman’s mother had an affair. In time, Mr. Forman found his biological father, who survived the war and was living in Peru. Raised by foster parents, Mr. Forman attended film school in Prague, and first made his mark with his work on a film and theater presentation at the 1958 Brussels World Exhibition. An early feature, “The Loves of a Blonde,” won attention on the international festival circuit in 1965. Another, “The Firemen’s Ball,” two years later, rubbed Czech officials the wrong way with its spoof of the firefighting bureaucracy, though Mr. Forman was already turning his attention to opportunities abroad. When the Soviets invaded in August 1968, Mr. Forman was in Paris negotiating to make a Hollywood film. His first US feature, a youth comedy called “Taking Off,” was released by Universal Pictures in 1971. It did so poorly, Forman later said, that he wound up owing the studio $500. Through the early 1970s, Mr. Forman — a hearty bon vivant without means for the good life — went through a period of self-described depression. For much of that time, he holed up in New York’s Chelsea Hotel, sleeping through the days and communicating with émigré friends. By then, he had been married twice, first to an actress, Jana Brejchova, then to another performer, Vera Kresadlova, who had remained in Czechoslovakia with their two sons, Petr and Matej. In addition to Petr and Matej, he leaves Martina Formanova, his third wife; and his twin sons, James and Andrew, with Formanova. In his memoir, Mr. Forman said the producers of “Cuckoo’s Nest,” Michael Douglas and Saul Zaentz, sought him out because “I seemed to be in their price range.” In fact, they had made a perfect match between filmmaker and material, in this case a cult novel by Ken Kesey. Jack Nicholson was the movie’s star. But Mr. Forman — who liked to coax star performances out of lesser-known actors — did exactly that with Louise Fletcher, who won an Oscar for her portrayal of the dictatorial Nurse Ratched. “Hair” and “Ragtime,” which came next, left less impression but kept Mr. Forman on the list of directors whom executives were willing to trust with their more sophisticated projects. In 1978, meanwhile, Mr. Forman joined Frantisek Daniel, another Czech, as co-director of the film program at Columbia University’s school of the arts. It was for Zaentz that Mr. Forman next struck gold, with “Amadeus.” The film won eight Oscars and, Mr. Forman later wrote, left him with a bittersweet, and ultimately correct, sense that his career had peaked. “Valmont,” based on an 18th-century novel by Pierre Ambroise François Choderlos de Laclos, was overshadowed in 1989 by the previous year’s release of “Dangerous Liaisons,” a film by the director Stephen Frears, which used the same underlying material. Mr. Forman next made a series of films, each of which pushed Hollywood out of its comfort zone. “The People vs. Larry Flynt” pressed the limits of tolerance for an antihero with its sympathetic portrait of Hustler magazine publisher Larry Flynt. Released by Columbia Pictures in 1996, it was a box-office bust, with domestic ticket sales of only about $20 million. In 1999, “Man on the Moon,” Mr. Forman’s complex portrait of the comic Andy Kaufman and his alter-ego Tony Clifton, did only a little better for Universal Pictures. His next film, “Goya’s Ghosts,” for Samuel Goldwyn Films, was an intricate examination of persecution in Spain in the era of religious persecution and Napoleonic conquest. The film found a minuscule audience when it was released on American screens in 2007. But it appeared to play out themes from Mr. Forman’s life, as its heroine, an artist’s model, was imprisoned and tortured because of what were claimed to be her hidden Jewish habits and roots. In an interview with a writer for The Star Tribune of Minneapolis, Mr. Forman talked of Goya’s vacillation between unfettered expression and a desire to please, in terms that recalled a tension between his own artistic urges and the lure of success.